Credit Suisse is sponsoring Bloomberg's recently launched iPad app, Bloomberg Television+, in a deal brokered by Havas Media International. The year-long sponsorship aims to boost awareness of Credit Suisse among a target audience of high-net-worth individuals. 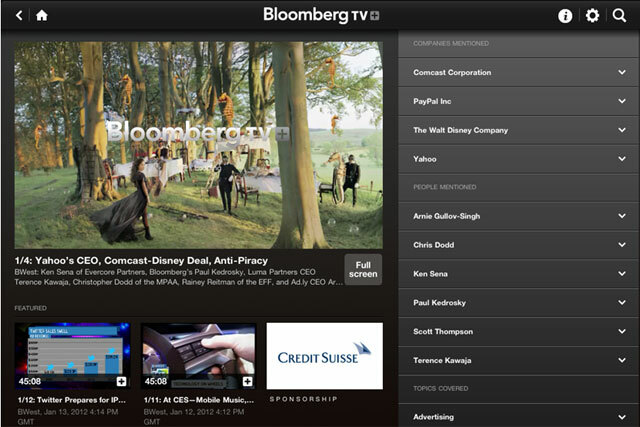 Bloomberg Television+ was released in October last year and enables users around the world to watch Bloomberg as it appears on television, access on-demand episodes of top shows, search clips according to topic and watch breaking news and interview highlights. It is a free, live-streaming, 24/7 video app for business news on iPad and also features exclusive two-minute 'News Express' updates. David Goodall, managing partner at Havas Media International, said, "Bespoke research undertaken by Havas Media International and Credit Suisse provided the insight that their target audience of high-net-worth individuals rely heavily on tablets in their day-to-day business lives. "They are frequent business travellers and, as such, tablet technology has quickly allowed them to stay informed whilst on the go, wherever they are in the world. This led us to a strategy of targeting key app and tablet initiatives with content providers who prove to be essential reads for our target audience."